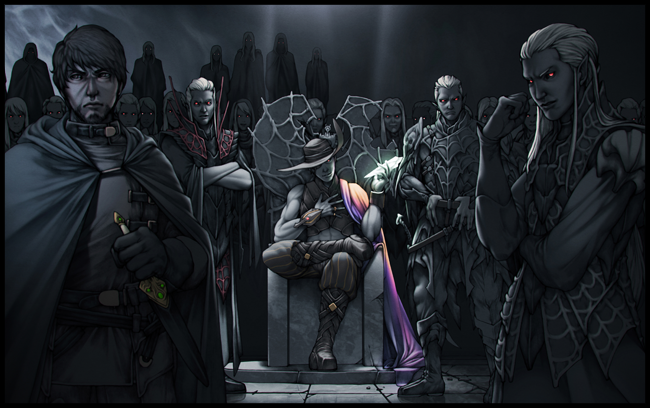 From left-to-right: Entreri, Rai-guy, Jarlaxle, Berg'inyon, Kimmuriel. By Gido. //OOC: This thread is open to everyone who would like to interact with Bregan. Post any jobs you wish for us to be fulfilled or if you wish to seek us. Last edited by adobongmanok on Wed Apr 04, 2018 11:57 pm, edited 1 time in total. A red-masked individual can be found sitting in Gloura's Wings regularly. It seems that the said individual used to be a trader of exotic goods. Now, he is looking for anyone who is interested to join Bregan D'aerthe. One of the agents who had been spending time on the Realm Above was greeted upon their return and a new acquaintance was made. A letter was delivered to Bregan d'Aerthe by an utterly terrified goblin slave. It would scream and shriek and repeatedly refuse to hand the letter over to anyone except Conjurer Vesche himself, claiming it was 'The Master's' strict orders. "Tell the Lieutenant that Blackblade respectfully requests audience. Inform him it is a...somewhat pressing matter." The warrior would then simply stand there in a rigid guard stance, a silent, dark steel monolith, waiting for the sentry to return. An half-drow woman walks in and leaves a note. "Greetings, I'm Lyth'raina Ssambra and I would like to meet with Conjurer Imyvor Vesche. I am interested in joining Bregan D'aerthe and I would like to politely request an audience." Can usually be found from 11pm GTM+0 onwards. in the darkest corner of the entrance hall, opposite to Valen and Nathyrra, a dark-clad, cowled warrior wearing the heaviest suit of armor conceivable observes her every move, his crimson gaze like two pools of red radiance coming from the shadows within the hood. Once she leaves, he intercepts the guard with the message, and brings it to the inner chambers personally. A red-masked drow visits the guild hall and notices the note that was left by the half-drow. "Lyth'raina", he murmurs to himself then goes about his way. A goblin messenger is dispatched to the Bregan D'aerthe headquarters from the school of illusion&phantasm. It introduces itself as Ryld, or slave in the drow tongue; its master, unimaginative when it comes to naming his possessions is clearly inventive in administering discipline as the creature looks rather well behaved. It asks for the lieutenant by name and makes sure to pay proper homage to him, before handing over an envelope that would appear invisible to everyone but the conjurer himself. Gracing the halls of Bregan d'Aerthe in the only manner she knew, Schezalle exuded the extravagance of fine spidersilk cloth bedecked with gold lace and glittering with encrusted jewels, whilst her every step swooned with sensuality. Her objective, apparently singular, was accomplished when Conjurer Vesche came out to meet her in the foyer. After some trivial banter, the duo retired to Vesche's private office and did not emerge thence for several periods. The Black Claws' jabbress immediately departed for the Sshamath markets, exchanging wry smirks with The Conjurer as she left. A hardy drow sargltin strut into the public bar of the Bregan D'earthe compound - the sarol'veldruk of l'Orbb Glennen, Nargazul. The young male's hard face - primitive and brutal for a drow though at least baring the symmetries of noble breeding - was warpainted with now dry blood. His body was enveloped from the throat to his dark plated shins in a fine piwafwi that nonetheless looked as though it had seen better times. A long mess of hair as fine as spider silk fell freely over his broad shoulders and down his back - crowned at the brow with a band of studded leather. As he approached the bar he deliberately but casually parted his piwafwi by his elbow to reveal that he was armed - two jeweled scimitars carried on his rothe hide swordbelt gleaming dangerously in the low light. After flirting with the barmaid briefly he informed her that he was looking for the drow warrior reputed of invincibility; the one called Blackblade. After some waiting, Nargazul learned he was unable to meet with him this cycle. With a cold, black lipped smile he said he would return again. "So...invincibility, hm? Well...I've been called worse in my three centuries. Send him to me next time he shows up." Before vanishing into the inner chambers of the compound. 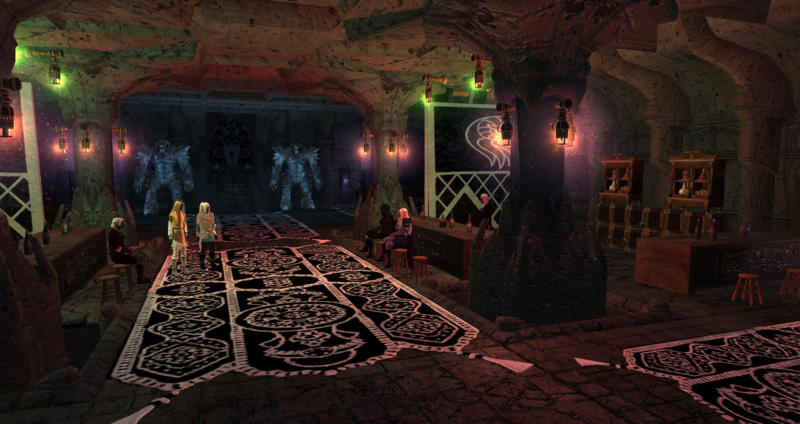 Visitors to Bregan D'aerthe's public pub area would quickly come to notice an illithid present. The one-eyed illithid is clearly a member of Bregan D'aerthe but little is known of its background and how it came to serve the mercenary company except that it was a gift from the hive mind due to the actions of the orc-member known as Wirg. Its presence naturally symbolises an increase in security of the Sshamath cell's headquarters. 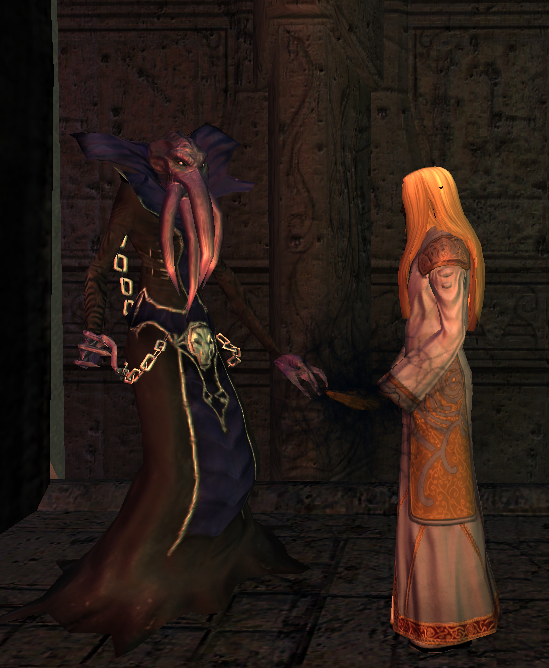 The current Lieutenant, Conjurer Vesche, appears to be unbothered by the presence of the illithid. 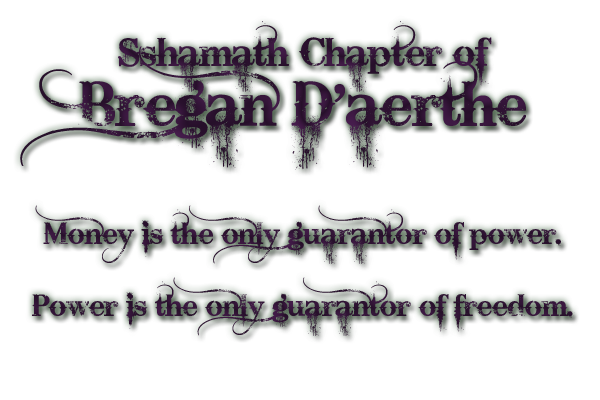 Words might be shared by the bar wenches in Bregan D'aerthe of that Conjurer Vesche was one of those who had gone to the hive mind with Wirg and that only Wirg and Vesche returned with their minds untouched. (( As always, anyone's welcome to enjoy the bar area! The above is the result of RP over a year ago. And as always, if you think any NPC would report anything back to anyone in BD as a result of your character's visit, you're welcome to send us a PM as it can be assumed that NPCs report noteworthy comings and goings as well as happenings. The Conclave soldiers, jaluk and moon elf are received by the Lieutenant himself. Whatever the exchange was, the Conclave soldier and jaluk could be seen leaving some time later. Later on, the moon elf is seen exiting Bregan D'aerthe's headquarters escorted by three individuals, one of them a Bregan D'aerthe member. The group leaves via Teleportation magic.